Have you seen websites that offer Connect with Facebook option for registering? 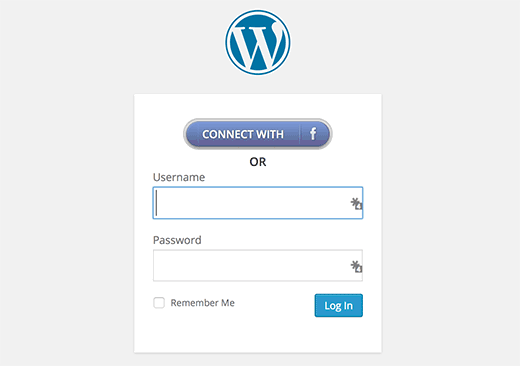 Want to add login with Facebook option on your WordPress site? In this article, we will show you how to add one-click registration and login with Facebook in WordPress. Why Add Facebook Connect on your site? Some people hate filling out registration forms and waiting for confirmation emails. Adding a Facebook connect option makes it convenient for users to register on a site by using their Facebook account. For those users who prefer to use the regular registration can still do so. Let’s take a look at how to add login with Facebook in your WordPress site. First thing you need to do is install and activate the Nextend Facebook Connect plugin. Upon activation, go to Settings » Nextend FB Connect to configure the plugin. You will need to connect the plugin with a Facebook app. If you are already using another plugin to add Facebook comments, Recommendation bar, or Follow buttons, then you may have already created a Facebook app for your site. You can use the same app’s ID and secret keys in the settings. If you do not have a Facebook app, then you can always create it for free. Simply go to Facebook Developers site and click on the create new app link under My Apps menu. A popup would appear asking you to select your app platform. You need to click on Website to continue. After that you need to provide your app name, name space, and a category for your app. 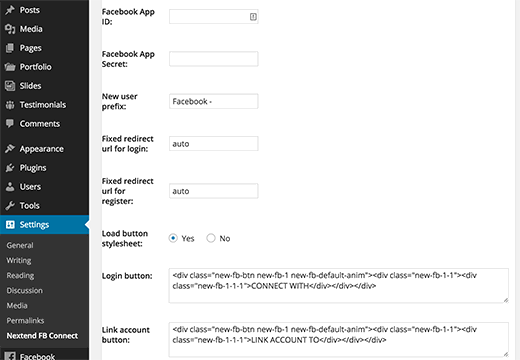 You can use the name of your website as the app name and namespace and click on the create app ID button to continue. Facebook will now create your app. On the next screen, scroll down a little to enter your site’s URL and then click on the Next button. That’s all, you have successfully created your Facebook app. You can visit your app dashboard by clicking on My Apps menu at the top and then going to the app you just created. Make sure to copy your App ID and App secret from the dashboard. Return back to the Nextend Facebook Connect’s settings page on your WordPress site and paste app ID and app secret keys. Once you do that, review other options on the screen and click on the save changes button to store your plugin settings. 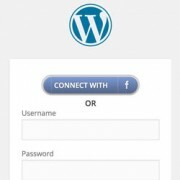 That’s all, we hope this article helped you add login with Facebook in WordPress. You may also want to check out our guide on 5 ways to get more Facebook likes using WordPress. Nice to know but you do’t use it here? Why? Your plug in simply doesn’t work. Your documentation is inaccurate and doesn’t reflect the latest process on Facebook. Please contact plugin author for support. This plugin is not working properly. but when i logout my account and click in the login link it automatically logged me in with the previous id. How can I login with individual account with this plugin ? WHAT NEXT? How do I get the FB login to show up on my login page? Your guide is very complete but leaves off the final step. Google is asking for a verified personal Facebook account to establish this link. I have tried all possible combinations I can think of -website name, facebook web address, facebook name – to no avail. Previously in wordpress it was simply a matter of adding the facebook logo and making a connection the URL. Is this option no longer possible due to spam issues? Hi There, thanx a lot. I want to have only ‘fb login’ on my site, is there a way to remove wordpress registration? Very nice post. I want to use one plugin for Facebook, twitter and pinterest. Is there one for this purpose. Thank you for this post. Do you if this kind of connexion is compatible with redirect plugin like “Peter’s login redirect for example”? This is super cool. Thanks for the great post. My only question is if I’m trying to obtain an email list for subscriptions to my site, am I able to get the email from the Facebook plugin?